Parents of new students can expect to start receiving the newsletter by the end of their student's first semester. 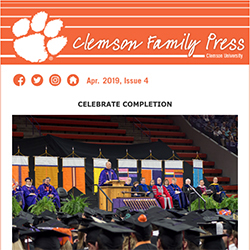 For other and older newsletters, please visit our Clemson Family Press E-Newsletter Archive. The Family Handbook features articles, programming and interactive content tailored to new students and their families. 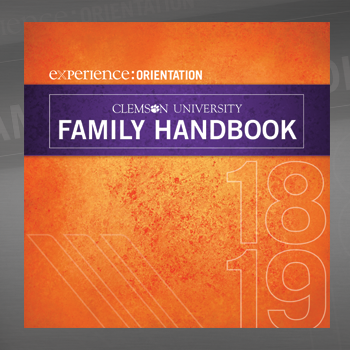 This version of the Family Handbook works in conjunction with the printed handbook that each family is given during New Student Orientation, and provides interactive content including web links, email links, image slideshows, video, animation and more! Click here take a look at the 2018 Family Handbook. 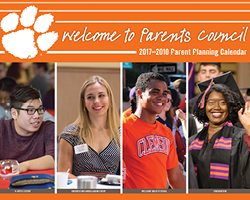 The annual parents planning calendar, Welcome to Clemson, is available each year in the summer to new Clemson families at the orientation sessions. There is valuable information included about Clemson academic deadlines, as well as tips and CU Facts. This calendar is available for you at no charge in the Student Transitions and Family Programs office, located on Clemson campus at 902 University Union. If you would like a calendar mailed to you, there is a $5.00 s/h charge. CLICK HERE TO ORDER a calendar via mail. Limited supply available. 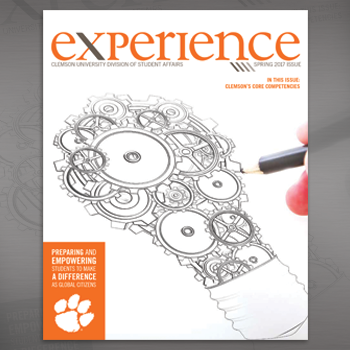 The Student Affairs Experience Magazine showcases future and planned initiatives and developments. We invite you to take a look and learn more about the division and how our capital projects will benefit students and the University for years to come. Many things are happening for students throughout the year between involvement, handling the shifting relationships from college to home, academia, finding a job, balancing time, having a roommate and much more! This is a space where students will give some insight of what is going on throughout the year and some useful resources to manage these shifts. Click here to visit the Tiger Talk Blog and get the student perspective!